S4BB Limited just released Signal Booster 2.1, an update for the famous signal strength enhancer app. The all new 2.1 version improves stability and performance of the app and contains minor bug fixes. 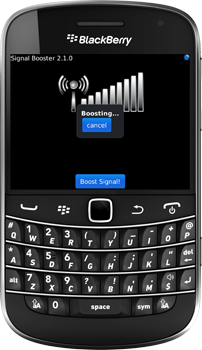 Now you will be able to see your current signal right away with just opening the menu on your BlackBerry® Smartphone. No device reset required. Therefore a lot faster than everything else! NEW: Improved stability and performance! NEW: See your current signal in the menu list. All BlackBerry® Smartphones running OS 5.0 and up. Previous Previous post: New Easy Smiley Pack 2.0 for BlackBerry Messenger! Next Next post: Get information about 270 countries & regions onto your BlackBerry or Android Smartphone!